In the spring, a good friend from Portland, OR suggested that I fly out to see Foo Fighters play the Moda Center on September 10. This invite stirred with me as I thought about where to get away to next. A trip to Iceland had also been brewing, but I decided to put that one on hold for the time being and I packed my bag once again for the west coast. I arrived to Portland the day after my birthday on Sunday, September 2 and hung out with my friend Adam. The next day I traveled solo down Oregon’s rugged and stunningly beautiful coast in a rented Nissan, in search of the true colors of life. My plans were loose with no reservations, but a dire need to break away burned deep. I traveled south through Corvallis then west and hit the Pacific coast at the small town of Newport. From there I followed the coast south on Highway 101 and stopped at Yachats which has a wonderful rocky beach. I took a few photos as waves crashed in and watched a black lab have an incredible time running the beach and diving into the waves. When I returned to the parking lot, I met a local retired man who was having car troubles. I spoke to him for several minutes and he was kind and offered me some spots to consider as I traveled further south. I asked if I could help him in any way, but he declined, so off I went. It was clear and sunny in the early afternoon when I drove through Cape Perpetua. I had considered stopping there to hike and photograph Thor’s Well but the light wasn’t good and the tide was low so I moved on. I last traveled down Highway 101 in 2013 with my friends and clients from Fluff & Gravy Records when we had a business retreat at a beach house in Bandon. Traveling this stretch of the Oregon Coast Highway again was a pleasure and I soon found myself passing through Bandon, then the heavily-cliffed area of Port Orford where the ocean had a unique heavy blue color. Dr. Wayne Dyer’s audiobook “Wishes Fulfilled” played in the background when I made it to Harris Beach State Park near Brookings just a few miles from the California border in the early evening. Here I set up camp for two days and spent most of my time exploring the coast. Samuel H. Boardman State Scenic Corridor was to the north and provided amazing hiking and photo opportunities, but unfortunately forest fire smoke from California drifted in and blanketed the sky the first night. The next morning I explored the beautiful rocky shore of Harris Beach before traveling north once again. I stopped at the Natural Bridges wayside and hiked for a while before returning to the overlook deck. I was told the night before by another photographer of a hidden trail that provides a much better view of Natural Bridges. The trail was very steep and slick in spots but I found my way down to the open view just above the water. The good morning light for photography had already passed, so I just took a few shots before sitting down in tall yellow grass to admire the calming scene. Later that day I found a shortcut trail to Hidden Beach and spent a few hours there by myself as waves crashed in meditatively. I finally started to slow down and feel the rhythm of nature around me as I rested on a large volcanic rock just above the ocean. Hidden Beach wasn’t going to provide a great view for sunset, so I hiked out at dusk and went back to Arch Rock which faced straight west. There were a few other photographers around and I spoke to a gentleman named David who was on the road traveling solo on his motorcycle. He was from California and said he’d been traveling for months after ridding himself of most of his possessions and renting his house out for passive income. Internally, it seemed he was running from something, and I felt a great understanding and wished him well. The campground was covered in fog when I woke early in the morning, and as the sun rose, rays of light filtered through tall fir trees in a mystical fashion. I had hard cheese, an avocado, and mushroom coffee for breakfast, and soon found my way across the California border and into the redwoods. It was a cool morning and grey clouds misted lightly as I drove. I wanted a camp spot before adventuring out for the day and stopped at Del Norte Coast Redwoods State Park south of Crescent City. Unable to occupy my campsite until 2pm, I searched the map and found what appeared to be the closest hiking trail outside the campgrounds which was aptly named the Damnation Creek Trail. It took me several passes before finding the unmarked trailhead, and when I arrived, an elderly man from Alabama had just returned from hiking. We spoke about photographing the redwoods and as we parted, I told him, “Have a great day.” With a clear spark in his blue eyes he responded, “Every day is a great day! Especially when you’re out here!” I laughed at that assessment and started the hike with a smile. Damnation Creek Trail was used for centuries by Native Americans to access the Pacific coast and it is known to be a challenging up and down hike. As I moved on from the parking lot, several trails were woven together and intersected around massive old growth redwoods. This was my first time up close to some of the tallest trees on earth and it was a mesmerizing and peaceful experience. But after going over and under branches and logs, I soon realized the trail I had taken was only a spur trail and it seemed to have completely vanished. I gazed up in awe and took a few photos, seeing in the distance that the light was dramatically different in an area where Pacific fog moved in. I bushwhacked lightly through knee deep bright green ferns, sometimes walking on the back of massive downed redwoods and found myself above a gully with a surreal view. The energy in the air was something that I’ve never felt before and my anxiety eased as I relaxed and took photos of my surroundings. I have felt the sinking feeling of loneliness more often than I would like to admit, but sometimes while alone in nature, I feel truly alive and surrounded by love. The redwoods, standing high in their reverent esteem, seemed to tell me that I belonged. In my heart I knew I was supposed to be there and I was grateful. A hum of cars could faintly be heard in the distance on Highway 101 so I knew which direction I needed to go. It was a pleasant trek out and I moved slowly, careful not to disturb my beautiful environment. Soon enough I found the highway about a half mile south of my car and walked the shoulder of the road back, before heading to the state park to set up camp. That night I explored some of the park, at one point finding myself inside a massive hollowed out redwood trunk staring up as a few stars showed behind light clouds that danced on by. The next morning was cloudy and cool and I drove north and then east into Jedediah Smith Redwoods State Park which is known to have great hiking trails. Since the weather wasn’t looking good for the day, I made a decision to just do a short hike and then move northeast towards Bend and central Oregon. 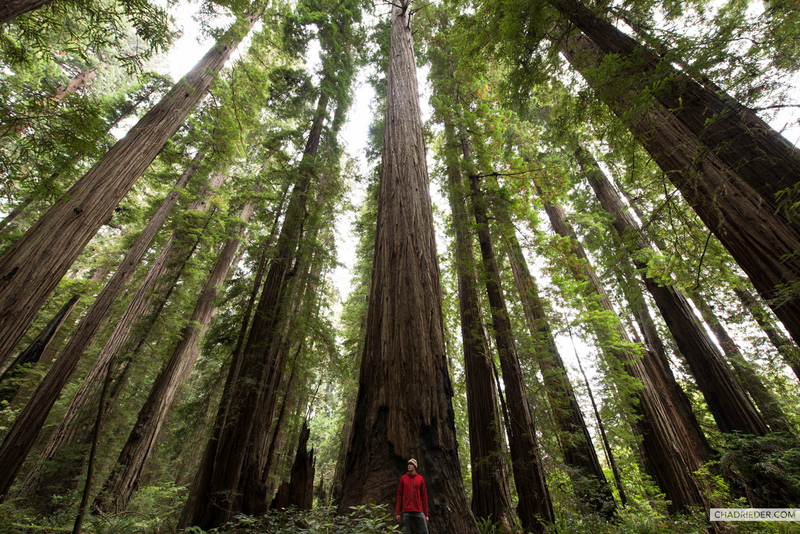 Stout Memorial Grove Trail is an easy hike that has a large concentration of old growth redwoods. I arrived early in the morning before anyone else was around, and it was quiet and the air was calm and serene. The redwoods in this area are massive and the sun flashed through the heavy clouds from time to time. As I was leaving, two large groups of people started the hike and I felt fortunate to have had it all to myself for nearly an hour. When traveling solo, I listen intensively to my intuition and ask the universe to put me in places where I can learn and feel something new. Alone in the redwoods, I was guided with a deep connection to spirit and it felt ethereal. I drove east on Highway 199 that follows above the Smith River through the gorgeous Pacific Coast Range before heading north and back into Oregon. It was a lovely drive until I neared Grants Pass, OR where forest fire smoke began to thicken the air in an orange haze. A few hours later I passed through Umpqua National Forest near Crater Lake and the air was even worse, with ash wafting through the air at times like feathery grey snowflakes. After over five hours of driving I made it to Bend and the sky was very hazy in the late afternoon with a sweet unique scent of sage and juniper filling the air. I picked up a few supplies before heading west into the mountains with hopes of finding a good camp spot for the night. Sparks Lake is a shallow alpine lake in Deschutes National Forest nestled below Mount Bachelor. When I arrived, paddlers and cars filled the area and I struggled to find a spot near the shore to stop and set up camp. Disheartened, I turned around and drove out slowly but then noticed an opening between tall fir trees on an elevated peninsula where I would fit. I backed in and had found the perfect place to camp, hidden below right on the lake shore. I pitched my tent on a flat sandy area near the edge of the water and soon the day paddlers moved on and Sparks Lake was quiet. I made dinner, cheerfully popped open a local IPA, and the haze of the fires pushed out as the evening temperatures dropped. I walked down the road at sunset and spotted a deer calmly step out of the woods while keeping a safe distance from me. The doe drank from the lake for about ten minutes before moving quietly back into the forest. When I returned to camp, one by one the stars came out and soon the entire sky sparkled above me. I set up my tripod and pointed my camera to the sky, howling in ecstasy on more than one occasion. Basking in the glow of a starry night while rainbow trout occasionally splashed the surface of the lake, I was where I was supposed to be. The next day I stopped by a few other alpine lakes in the area before heading back to Bend to get a hotel room to get cleaned up. That day I wandered around downtown and areas near the Deschutes River and checked out some of the famous local breweries. While I was at 10 Barrel Brewing enjoying their Apocalypse IPA, I received an email from the Foo Fighters team approving me to photograph their Portland concert. I gave a cheers to the universe and overflowed with excitement. I pushed west the following day into Willamette National Forest and hiked the waterfall trail on the McKenzie River in the morning. It was a beautiful clear day, with a light mist from the fast-moving river wetting the trail at times. It felt great to be out of the city and back in nature again breathing in the sweet forest air. After having both Koosah Falls and Sahalie Falls to myself, I took my time and hiked back to the car in the early afternoon. Since it was Saturday, I was fortunate to have found a campsite just down the road at Coldwater Cove Campground on the southern edge of Clear Lake. I chose the best of the two remaining sites and had lunch and read for a while before taking a nap in my Nemo tent below a massive fir tree with a forest breeze moving through. When I woke, the homemade cold brew that had been steeping in my cooler for two days was delicious and uplifting. I explored the trail around the wilderness lake that evening, eventually settling in to a nice view on the south side where a log sat perpendicular to the shore. The sunset was beautiful and soon the sky was once again filled with sparkling stars and constellations. With my headlamp guiding me, I hiked around until after midnight and felt happy and blessed. I slept very well that night. On the way to Portland the next day, I moved west and stopped at Silver Falls State Park near Salem. This was a mistake unfortunately, as long lines of cars and tourists filled the area to see barely-trickling falls due to the hot dry summer the area had. Frustrated with the amount of people, I didn’t stay long and made it back to Portland with time to see some of the downtown area before meeting my friends from Fluff & Gravy Records for sushi and saki at Uchu on Mississippi Avenue. Later that evening we watched their artist Anna Tivel play a lovely set at Mississippi Studios, then we bid farewell with hugs, before I met up with my friend Adam again. Foo Fighters headlined Moda Center the following day and I was incredibly excited to have a photo pass waiting for me. I’ve photographed hundreds of bands in the last ten years, but none have given me more joy than Foo Fighters. Dave Grohl is the reason I learned drums after all, and seeing him up close with my camera in hand brings me an unrelenting amount of joy. As I waited backstage in the Portland Trail Blazers’ media room before being escorted to the front of the stage, I felt a deep sense of gratitude for where I was in that moment, and for the heart-fulfilling adventure I had been on over the previous eight days. Trading the endless scrolling, swiping, and digital dependancies for something true and meaningful is necessary in my life. My compass is pointed towards positive real world experiences with thorough trust the universe will guide me. And as I follow my bliss, I know there are rewards waiting. I used to believe a lot in luck. But I have learned that luck rarely has anything to do with accomplishing things in life. Luck is created by doing the hard work and putting yourself in situations that are aligned with your true being. We are all responsible for ourselves and for who we are in this moment. And as I stood before my favorite musician taking some of the best music photos of my life with an arena full of screaming fans behind me, I knew I was supposed to be there. I did the work. I followed my heart. When I later returned to my seat, I put my arm around my pal Adam and smiled. We witnessed an excellent rock show that night and I was wholeheartedly present in every head-banging moment.